Stefan Horik was born in 1965 in the province of Quebec, Canada, from a father of Ukrainian origin and a French Canadian mother. During the first seven years of his life, he followed his parents in their travels until the whole family settled down on an old farm in the Charlevoix County some 70 miles east of Quebec City. His place of residence and his family environment have no doubt influenced what he is currently doing. Since childhood, he has been living in the magnificent county of Charlevoix, which is an almost unlimited source of inspiration for him as well as for a great number of artists. The success of his first exhibition held in 1996 encouraged him to go on and his passion for painting only became greater. Stefan loves nature and adventure. 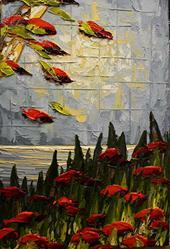 He travels all over North America and, drawing his inspiration from his travels, he then paints works marked by emotion. Stefan likes well-defined contrasts and significant variations in colour value. 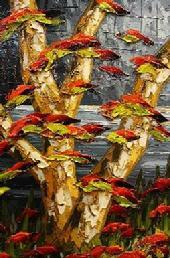 He paints very vibrant pictures with a pallet knife and great spontaneity. Stefan Horik currently exhibits his work in galleries across Canada and the next step is an opening in the United States. In short, the paintings of his promising artistic career are inspired by travel and time.